We create pieces of art featuring your family. Our goal is for you to enjoy these portraits as decor in your home for many years to come. There is nothing more priceless than a family portrait. Often we get wrapped up in today's busy world and forget what's really important. In this day and age with the demanding schedules we keep our lives go by so quickly and our families change before our eyes. 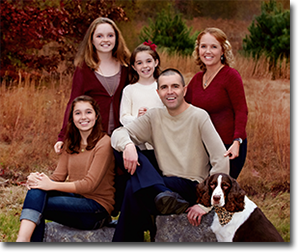 Over the years we have heard of all the reasons clients put off having their family portraits done, such as waiting to lose those extra ten pounds or not wanting the stress of coordinating clothing and schedules of everyone. We can help you with that. We offer you a relaxing pre-planning session where Susan sits down with you a few weeks before your session and shows you different samples and styles of family portraits taken both inside and outside with various color combinations and styles, both classic and casual. That way she knows exactly what your tastes are and what colors will coordinate beautifully with your home. We make it as painless as possible for everyone, we promise! Start your family's photographic legacy today!